Let your musical side come out to play. In the Westin Austin Downtown, located just steps away from the city’s 6th Street Entertainment District, the hotel rooms and lobby celebrate Austin as the “Live Music Capital of the World.” Look closely, and you’ll see the cutouts from a Dobro guitar in the lobby ceiling and vertical garden. There’s also a guitar-string staircase and guitar-pick artwork. Even the ballroom floors are decorated with the kind of prints you can find on guitar straps. 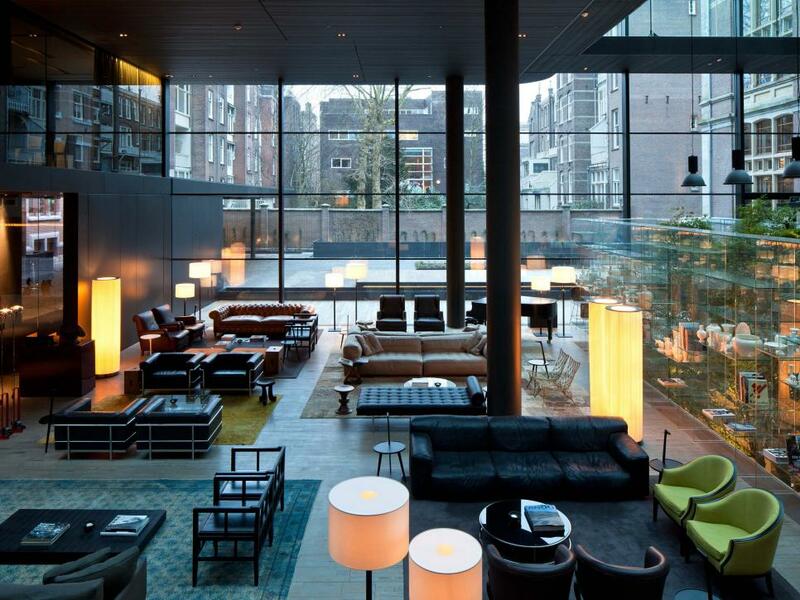 Located in the heart of Amsterdam’s museum district, the Conservatorium Hotel is known for its Art Nouveau interiors. 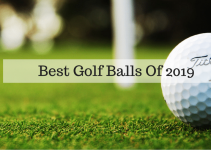 They were created by Piero Lissoni, who is considered one of Italy’s best contemporary designers. In this image, natural light streams into the Brasserie Lounge, which is located next to the lobby reception area. The custom-made furnishing and vintage rugs aim to make guests feel at home, in a space that is both simple and sophisticated. 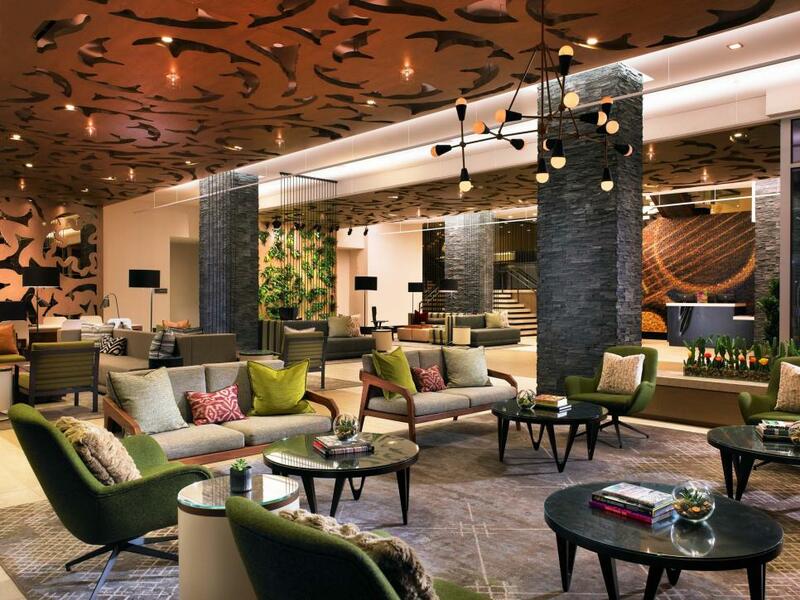 The old blends with the new at Le Mount Stephen, a luxurious hotel in Montreal’s Golden Square Mile. 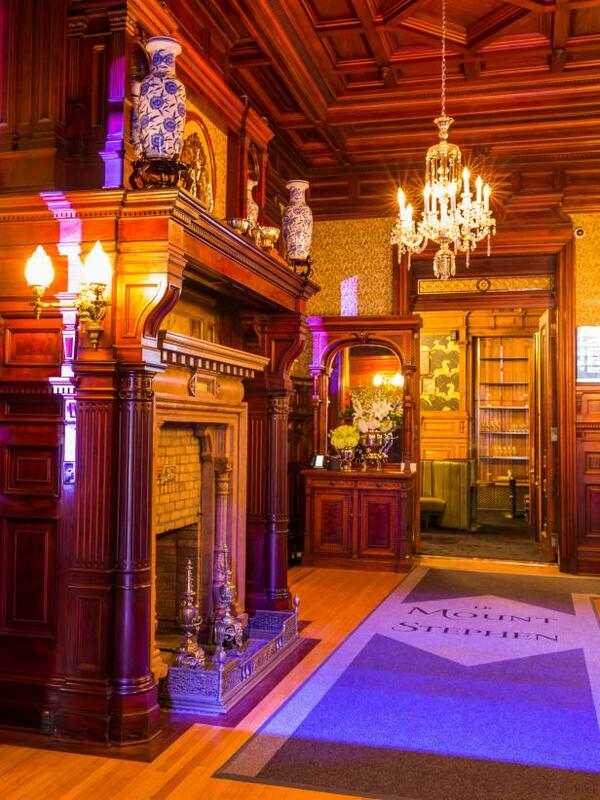 Visitors enter the hotel through the historic George Stephen House. The house—actually a Renaissance Revival-style mansion with a carved stone fireplace mantel and stained glass windows—was built by the Canadian Pacific Railway’s first president, Lord G. Stephen. After guests walk through the George Stephen House, they enter Le Mount Stephen’s contemporary tower. 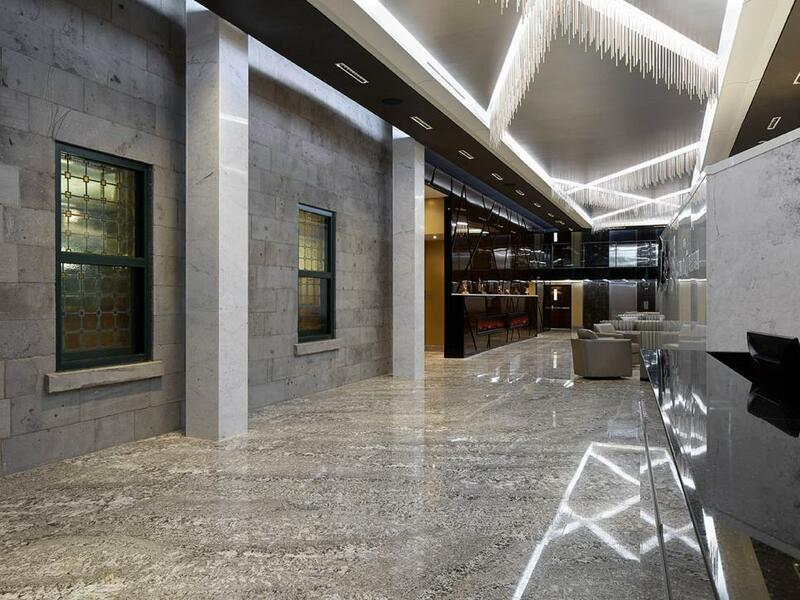 The lobby boasts a sleek, sophisticated design and features gold-flecked marble floors and the hotel’s coat of arms. Furniture is upholstered in neutral leathers and velvets accented with gold, silver and copper touches. 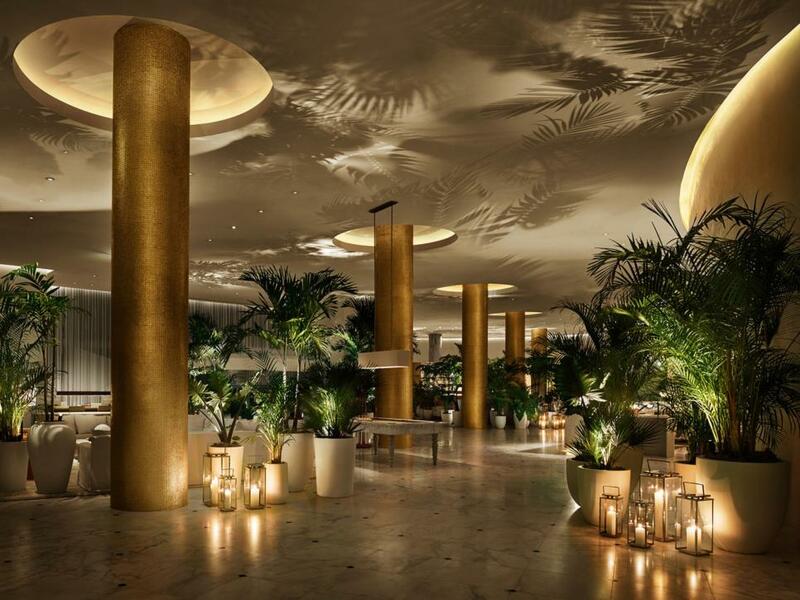 You’ll find the ultimate in glamorous gold decor at the Faena Hotel. Its magnificient entrance, shown here, is called the “Cathedral.” A red carpet runs through the space, past rows of gold-leafed columns and floor-to-ceiling murals created by Juan Gatti, an Argentinian painter known as the “Michelangelo of Faena.” At the end of the hall, a door opens into a garden featuring a 24-K gilded sculpture of a wooly mammoth skeleton. Okay. 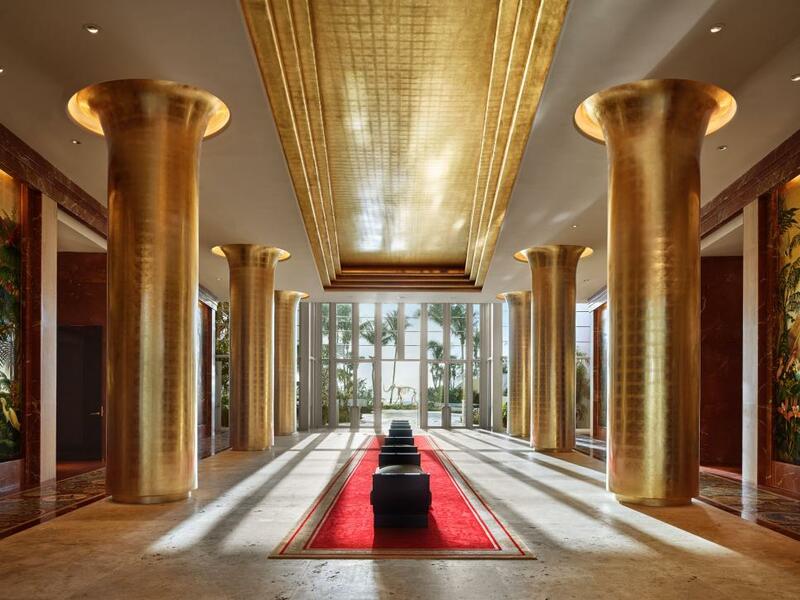 You’re probably not going to install enormous gold columns to mimic the ones in the lobby of the Miami Beach EDITION. But you can use a mix of minimalist furnishings, silk rugs, sheer white drapes and eclectic antiques for an elegant, modern look. Don’t forget the palm trees for a touch of airy, tropical greenery.